A total of seven players from Richmond area Highland Springs HS signed with HBCUs, and two more signed with another CIAA team. Ahman Powell showed how much it means to commit on Wednesday while proudly sporting a bow-tie of his new home at Lincoln University. 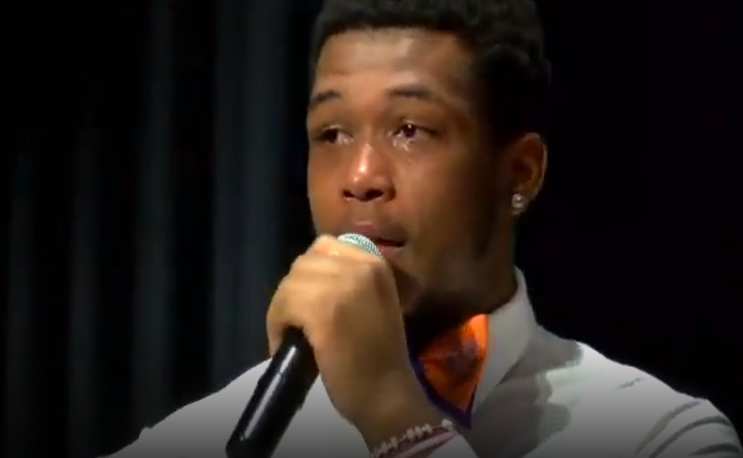 With tears in his eyes, he tried to explain what the opportunity to play college football means to him and his family. Powell is a 6’0′ 220-pound running back. He is one of the two newest Lions from Highland Springs, also joined by Dwakee Tyler. Tyler is a 5’11, 170-pound linebacker/defensive back. The two will be the northern-most of the HBCU commits at a school that is a certified HBCU football recruiting staple. Multiple HBCU athletes have emerged from Highland Springs High School through the years and the movement continued for 2019 for National Signing Day. Five of the 16 Highland Springs athletes that signed on Wednesday are headed to the CIAA and four to the MEAC. Seven total are headed to HBCUs. Quarterback D’Vonte Waller and running back Shy’Re McKeiver committed to Virginia State and will see the Lincoln duo in northern divisional play. McKeiver is 5’8″ and equipped with some dangerous speed. QB Waller had an impressive career at Highland Springs, finishing at 29-1. He collected four state championships, two back-to-back his junior and senior year. He also received offers from Saint Augustine’s and West Virginia State. Shaquez Cosby and Jason Jones wrap up the CIAA group committing to Chowan. Cosby is a 5’8″, 150-pound DB who can go end zone-to-end zone. Jones is a LB standing at 6’2 and 205 pounds. Cosby and Jones can also look forward to facing their teammates in northern division play. Devyn Coles, Rayquan Smith and Tremayne Talbert went FCS and committed to Norfolk State in the MEAC. Coles is a 5’11”, 175-pound DB that collected five interceptions his senior year. Talbert is 5’9″, 170 pounds and player receiver, defensive back and returned the ball, earning all-state honors at the three positions he played. Smith is a combo-back at 5’9″ and 200 pounds and also ran track. The Spartan trio will reunite with Waller and McKeiver of VSU on September 7 in Norfolk for the Labor Day Classic. Despite being in different divisions, NSU vs. VSU remains a rivalry game due to the fact that both programs literally fish in the same water for players.